Ghushmeswara exists at Devagiri near Ellora. Here the Lord is known by several names: Kusumeswara, Ghushmeswara, Grushmeswara and Grishneswara. There once lived a pious Brahmin and his wife. He was not blessed with a son. At the persuasion of his family, he married Kusuma in order to have a son. Kusuma was a great devotee of Lord Shiva. 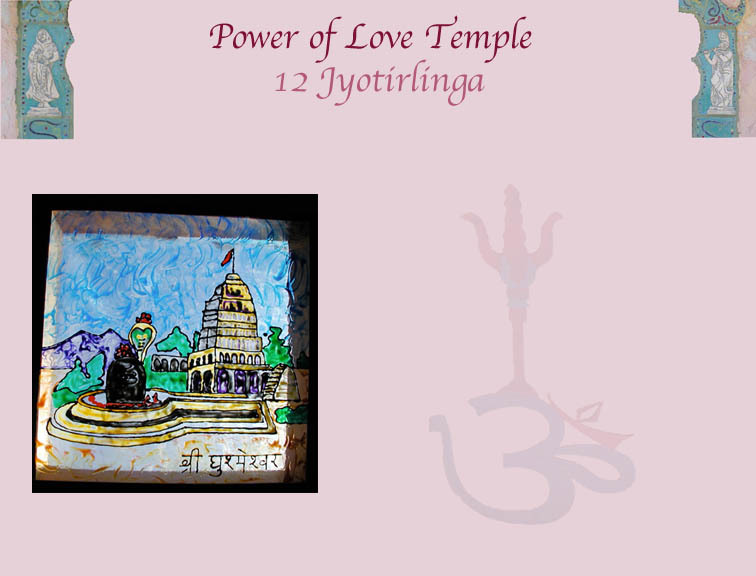 Everyday she would make one Shiva Linga, worship it and then immerse it in the temple tank. Soon she was blessed with a baby boy. The first wife was jealous and treated Kusuma poorly. Putting all her faith in the Lord, Kusuma bore all the suffering humbly. When the boy grew older, they planned his wedding. The jealous first wife, killed the boy with an axe. Kusuma was deeply grieved, yet did not stop her daily worship of Lord Shiva. She continued to make the lingam, worshipped and immersed it in the tank. To the surprise of one and all, her son rose out of the water one day, coming back to life. Lord Shiva appeared before them and blessed them. Lord Shiva declared that he would give darshan to devotees in his Jyotirlinga form at the same spot where Kusuma immersed the lingams. This jyotirlinga is considered to exist in two places, one at Devagiri near Ellora and the other at the Kailasa temple at Ellora.